The Twins added quite the haul of prospects to the farm system at last year’s trade deadline. Devin Smeltzer was not among the names to receive the most attention at the time, but he’s off to as good a start as anybody in the entire system. Come check out what Smeltzer did, as well as everything else that happened across the minors Friday. Yunior Severino was placed on the injured list with a left thumb fracture. Taking his spot on the Cedar Rapids roster is infielder Yeltsin Encarnacion. Also, Tanner English was activated from the Pensacola Injured List and RHP Jeff Ames was placed on the IL. I put Littell’s line above, but it was actually Mike Morin who was the opener tonight. He pitched a clean inning before Littell took over. Tyler Duffey struck out five batters in his two innings of relief and Jake Reed also pitched a shutout inning, but none of that matters much when you can’t score any runs. The Red Wings mustered just two hits, a John Andreoli double and a single from LaMonte Wade. Their best scoring chance came in the seventh inning. After Wade’s single, Luke Raley drew a walk, putting a runner in scoring position with one out. Unfortunately, Wynston Sawyer grounded into an inning-ending double play. Wow. Devin Smeltzer carried a shutout into the ninth inning tonight in an outing that followed an impressive 2019 season debut for Smeltzer. He’s now pitched 14 scoreless innings, has 17 strikeouts and has allowed just five hits and two walks. Smeltzer was absolutely pounding the strike zone tonight, and needed just 85 pitches to complete 8 1/3 innings. Tanner English put a fun finish on Smeltzer’s night, making an outstanding diving catch to open the eighth inning. It would have been fun to see Smeltzer try for the complete game shutout, but it is still very early in the season. He only threw 95 2/3 innings last season, as he was moved into the bullpen prior to being traded to the Twins in the deal that sent Brian Dozier to the Dodgers, so it makes sense that there would be a limit on how far he’d be allowed to go in just his second start. Cody Stashak came out of the bullpen for Pensacola and retired the only two batters he faced to secure the shutout. The Blue Wahoos scratched across runs in the first and second innings. Taylor Grzelakoski drove in a run on a groundout and English plated another on a single. There were a grand total of just seven hits in this game, all of them singles, and it took just under two hours to complete. Fort Myers trailed 1-0 heading into the top of the ninth inning, but Aaron Whitefield got things going with a lead off single, which was just Fort Myers’ second hit of the game. He advanced all the way to third base on a ground out to the second baseman, then scored on a Royce Lewis sacrifice fly. These two teams went blow-for-blow in extras. Fort Myers scratched across a run in the top of the 10th but Clearwater answered in the bottom of the inning. The Miracle took advantage of some sloppy play by the Threshers in the top of the 11th, scoring a pair of runs without the benefit of a hit. With the bonus runner on second base, the Miracle leadoff man struck out, but reached safely due to a wild pitch on strike 3. The next two batters also struck out, but then Lewis walked to load the bases and both Travis Blankenhorn and Jose Miranda walked to force in runs. At that point, Fort Myers had four runs on just two hits. So that’s gotta be it, right? Nope. Clearwater hit a leadoff two-run homer (yes, that’s right, minor league extra innings are weird) to tie the game. The Miracle managed to score another run in the top of the 12th, as Whitefield drove in Ryan Costello from third on a single. They stranded another runner at third base after two consecutive strikeouts ended the inning, setting up what seemed destined to be another answer inning. Alex Phillips took over on the mound for the Miracle and slammed the door. He snagged a comebacker and turned it into a leadoff double play (again, minor league extra innings are really weird). Phillips then induced a game-ended pop out. Tyler Watson gave up just one run over six innings and Tom Hackimer threw two more scoreless innings tonight, bringing him up to 4 2/3 clean innings so far. Hackimer has given up just one hit and has nine strikeouts. Great to see after 2018 was essentially a lost season for him. 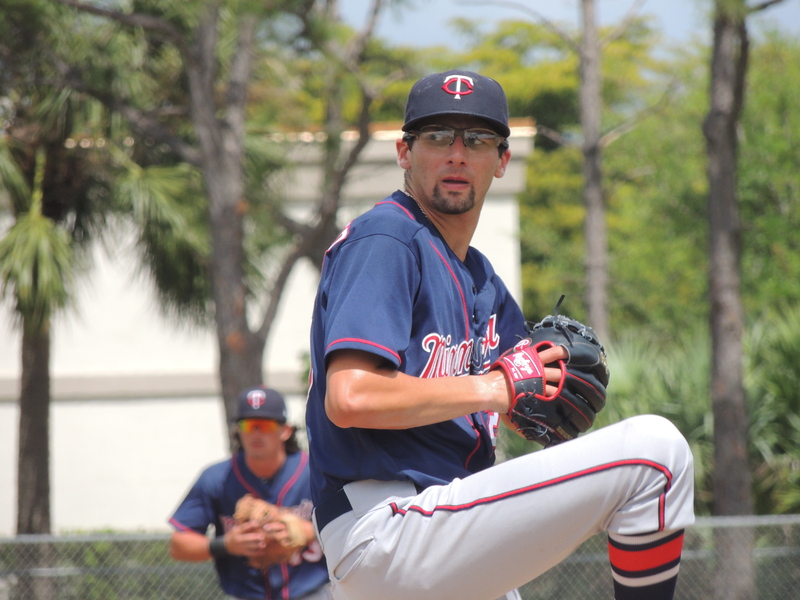 Cole Sands followed up an impressive professional debut with a rough outing in which he struggled with his command. Austin Schulfer came in and did an excellent job at stabilizing this game. He gave up just one hit over four scoreless innings and struck out five batters. Cedar Rapids took the lead in the sixth inning by drawing four (!) bases-loaded walks. They scored another run in the eighth on a three-base error followed by a sac fly. At that point, the Kernels had seven runs on just three hits. What a weird day of offense across the system. Gilberto Celestino reached base safely three times and stole a pair of bases. Jean Carlos Arias and Andrew Bechtold hit their first home runs of the season while Gabe Snyder tallied his first Midwest League home run. Arias also drove in a run on a walk and hit a sacrifice fly. DaShawn Keirsey was removed from this game after the second inning. Glad the Big Boys are having a good year to start because at MiLB, things are not looking good, especially on the offensive side of the ball. I totally forgot Smeltzer was part of the Dozier trade. I see Devin hasn't had a great minor league track record, but perhaps he'll start putting things together this year. And with Raley starting to build up momentum, getting this for 2 months of Dozier was quite the deal. Yes, small sample size and all, but Lewis is definitely struggling out of the gate. He's got a .380 OBP and he's hitting everything hard and playing great defense. Someone in the F/O gets a pat on the back if Smeltzer keeps going like this.And another pat on the back to the minor league field guy who put him back in the rotation. What a great start to last night's game and the season for Smeltzer.He may be the #4 starter on that team but his results have been nearly perfect early this season.Isn't it fun getting 3 W's out of 4 games? Always good seeing Whitefield's name on the multi-hit list.With his softball background, would be a neat story if he would make it.Also always like good outings by Wisconsin native Schulfer.Recall being impressed by his play in ETon last year. Count me amongst those who were really impressed by Tyler Duffey back in his rookie season.Although most hope is gone, outings like last night give us a sliver of hope that he can find something from that year and make it back to help the Twins later this season.I often wonder if the pitching coaches messed him up when stressing his need for a changeup the next year.I recall his having a decent fastball and two different curves, one at 12-6 and another that looked more like a slider.Maybe they should have left him do what he did awfully well those first couple months. What's really interesting is that last summer, the Dodgers moved him to the bullpen, and the Twins had him pitch in the bullpen last year. In fact, they sent him to the Arizona Fall League, in part, to work on working out of the bullpen. I was surprised to see them move him back to the rotation, and he's certainly making that look like a wise decision early this season. Keep in mind, guys can put up great minor league numbers and still be pretty marginal prospects. I'd say it still looks like a fair return for what Dozier was, at the time. Maybe we can can learn from this and put Romero back in the rotation. Dozier has a -0.5 war and 193 average with one HR.When you look at what he did last year we are lucky we got anything for him. Raley being on the 40 man next year will be fine, depending on the way he develops at AAA. He could be on the team in September. Smeltzer and the other guys who will need to be on the 40 man roster soon will hopefully be traded for some players to help the MLB squad around the trade deadline. It makes sense to me to use some of the ammo we got in last year's trades to help the team down the stretch in 2019. I'm not sure that's a useful way to look at it, though. As of July 31, 2018, Dozier had a bit of value -- I'd estimate approximately Raley/Smeltzer value. I'm certainly not saying it was a bad return, but it also doesn't look like a steal or anything. We haven't missed Dozier, but I doubt the Dodgers miss Raley or Smeltzer either, even if Dozier didn't do much for them. Will it? I'm never too eager to roster another marginal corner player without a useful place on the MLB roster. Hopefully. But you'll probably be helping the squad with guys like Dozier, Lynn, etc. We probably would have had equivalent expendable assets available to swing those type of deals regardless of what we did at the 2018 deadline.